Yaneer Bar-Yam, Jean Langlois-Meurinne, Mari Kawakatsu, Rodolfo Garcia, Preliminary steps toward a universal economic dynamics for monetary and fiscal policy, arXiv:1710.06285 (October 10, 2017; Updated December 29, 2017). We consider the relationship between economic activity and intervention, including monetary and fiscal policy, using a universal monetary and response dynamics framework. Central bank policies are designed for economic growth without excess inflation. However, unemployment, investment, consumption, and inflation are interlinked. Understanding dynamics is crucial to assessing the effects of policy, especially in the aftermath of the recent financial crisis. Here we lay out a program of research into monetary and economic dynamics and preliminary steps toward its execution. We use general principles of response theory to derive specific implications for policy. We find that the current approach, which considers the overall supply of money to the economy, is insufficient to effectively regulate economic growth. While it can achieve some degree of control, optimizing growth also requires a fiscal policy balancing monetary injection between two dominant loop flows, the consumption and wages loop, and investment and returns loop. The balance arises from a composite of government tax, entitlement, subsidy policies, corporate policies, as well as monetary policy. We further show that empirical evidence is consistent with a transition in 1980 between two regimes—from an oversupply to the consumption and wages loop, to an oversupply of the investment and returns loop. The imbalance is manifest in savings and borrowing by consumers and investors, and in inflation. The latter followed an increasing trend until 1980, and a decreasing one since then, resulting in a zero interest rate largely unrelated to the financial crisis. Three recessions and the financial crisis are part of this dynamic. Optimizing growth now requires shifting the balance. Our analysis supports advocates of greater income and / or government support for the poor who use a larger fraction of income for consumption. This promotes investment due to the growth in expenditures. Otherwise, investment has limited opportunities to gain returns above inflation so capital remains uninvested, and does not contribute to the growth of economic activity. CAMBRIDGE (October 17, 2017) — President Trump’s new tax plan will follow the familiar script of reducing taxes for the rich in the name of job creation. Not only will these trickle-down policies not work—they’ll make the problem worse. A new report by a team of complexity scientists demonstrates an alternative: increase wages to create more investment opportunities for the wealthy, thus creating new jobs and a stronger economy. In the ten years since the financial crisis, despite massive economic interventions and zero interest rates, unemployment rates have only now returned to pre-crisis levels. Poverty and debt continue to be widespread, and economic growth struggles to reach 3 percent. The new complexity science analysis describes the flows of money through the economy, not just the overall activity. It shows that there are two cycles of activity that have to be balanced against each other. The first is that workers earn salaries and consume goods and services. The second is that the wealthy invest in production and receive returns on their investment. The two loops have to be in the right balance in order for growth to happen. If there is more money in the worker loop, there aren’t enough products for them to purchase. If there is more money in the investment loop, consumers don’t have enough money to buy products so investment doesn’t happen. The paper shows that before 1980 there was too much money in the worker/consumer loop. That money was chasing too few products, giving rise to dangerously increasing inflation. After 1980, likely because of the Reaganomics tax changes, the balance tilted the other way. There was too much money in the investor loop and the result was a series of recessions. The Federal Reserve repeatedly intervened by lowering interest rates to compensate workers’ low wages with increased borrowing, in order to increase consumption. The research shows that the way the government is regulating the economy is like driving a car with only the accelerator and without using the steering wheel. Steering means keeping the balance between the two loops in the right proportion. While Federal Reserve interventions have helped overcome the recessions, today we are up against the guard rail and need to rebalance the economy by shifting money back to the labor/consumer loop. Since 1980 consumers have accumulated trillions of dollars of debt, and the wealthy have accumulated trillions of dollars of savings that is not invested because there is nothing to invest in that will give returns. This is the result of government policy reducing taxes for the wealthy in the name of increasing economic activity. No matter how much money investors have, these so-called “job creators” do not create jobs when consumers don’t have money to buy products. Increased economic activity requires both investment and purchase power to pay for the things the investment will produce. The research shows that Reaganomics had the right idea at the time, but there is need today for a new, bold policy change in the opposite direction. The economy will grow if the flow is shifted toward workers/consumers and away from wealthy investors. The work cautions, however, that this has to be done in the right amount. Reaganomics moved things too far toward the wealthy, so shifting the flow in the other direction has to be done in the right measure. The results suggest that current approaches to correcting economic problems by reducing government spending (austerity), while decreasing taxes for the wealthy to promote investment, are misguided. They may have been good policies in 1980 but they are long outdated today. It turns out that economic inequality is not just a social justice problem, but actually an economic problem. Fixing economic inequality will have dramatic benefits for economic growth. 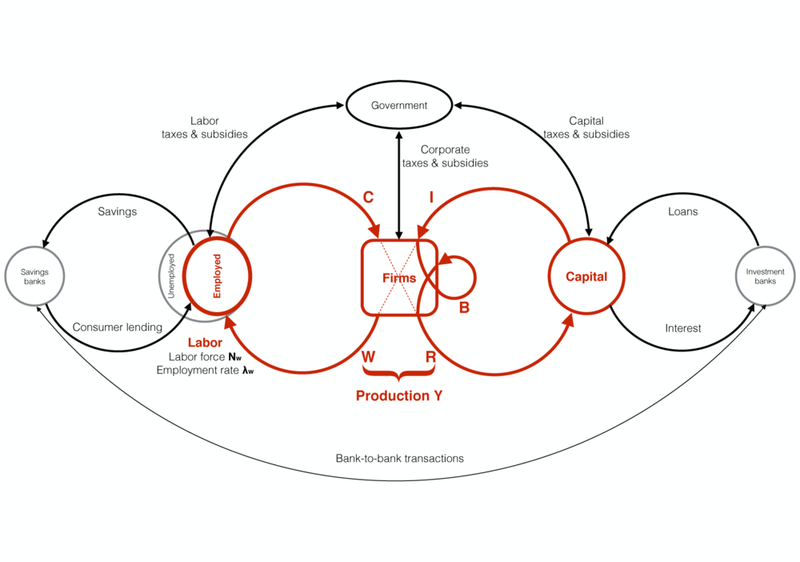 FIG 1: Schematic model of monetary flow representing the wages and consumption loop and capital and return loop (red). Transfers from or to banks (savings and loans) and government (taxes, transfers, subsidies and other economic activities) are also indicated (black). FIG 10: Plot of consumption versus investment between 1960 and 2015. The straight lines represent the dynamics of the economy if the ratio of consumption to investment were fixed. Recessions occurred in years marked by red dots. FIG 3: Economic flows in the US from 1960 to 2015 according to categories of Fig. 1. FIG 4: Fraction of economic activity for economic flows. The dominant flows are those of the primary loops in Fig. 1. FIG 5: Wages divided by wages plus returns (similar to sw in Goodwin’s model), reflecting the percentage of economic activity in the wages and consumption loop compared to the total in the two dominant economic loops. A transition between different behaviors is apparent in 1980. Fits are exponential (blue) and sinusoidal (red) curves. Using the expression in Eq. 22 from 1960 to 1985 we have λ= 0.12/yr, z0 = 70.8%, z1 = −0.64%, t0 = 1960, and Eq. 23 from 1986 to 2005 we have z0 = 59.8%, z1 = 1.65%, k = −0.69/yr, φ0 = −6.0, and t0 = 1986, with p < 10−15 and p < 0.0001, respectively. FIG 6: Estimates of borrowing and total savings (or debt) for Labor and Capital. A transition from capital borrowing to labor borrowing and capital savings in 1980 is evident. A. Labor borrowing obtained by subtracting wages and government benefits from consumption and taxes. B. Capital borrowing obtained by subtracting returns and government interest payments from investment and taxes. C. Labor total savings obtained by aggregating borrowing since 1960 and D. Capital total savings obtained by aggregating since 1960. Total savings (debt) is obtained by aggregating borrowing since 1960. FIG 7: Examples of economic development diagrams that indicate the state of the economic activity in terms of the wages/consumption (vertical axis) and investment/returns (horizontal axis). A. Shows stable flows that progress according to different policies that infuse the same proportion of money into each of the loops. This would be the case if all proportions would be functional. B. Shows the case where as one of the loops becomes larger than the other, economic activity is compromised and flows deviate in a way that eventually reduces economic activity consistent with the expectation that one of the loops is necessary for the other. C. Shows what happens to B when policies are shifted by adding additional flows to the investor loop. Scales are arbitrary. FIG 11: Same data shown in Fig. 10 but the region of the data between the 1960 and 2007 lines is expanded to the entire first quadrant by setting the 2007 vector direction as the x-axis (by subtracting it from all data) and, similarly, the 1960 straight line as the y-axis. Recessions occurred in years marked by red dots. FIG 12: Interest rate (blue), inflation rate (red), and real interest rate (green) showing the two regimes of behavior prior to and after 1980 consistent with investment limited and consumption limited regimes.This suggests that the current zero interest rate is not due to the financial crisis but rather due to the limiting behavior associated with the consumption limited regime that started in 1980.